The impact of Social Consumerism challenges businesses to rethink among many things: commerce, marketing, service, product development, employee engagement and customer experiences. 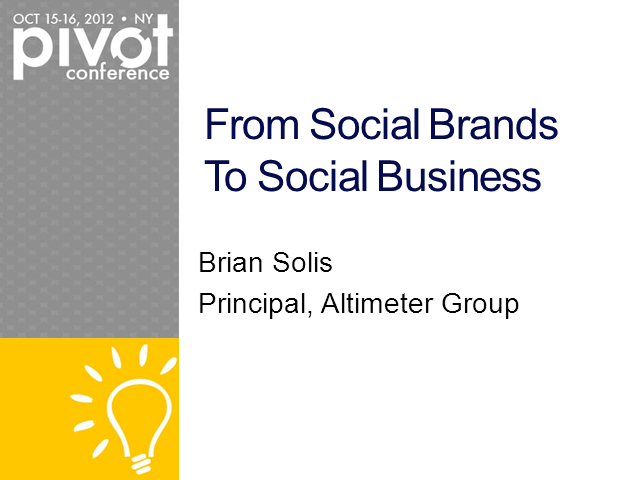 Brian will discuss the 2012 Pivot Conference theme, 'From Social Brands to Social Business' and how organizations must create a connected Social business, adaptive to new opportunities and unified in vision, mission and purpose. The fundamental relationship between artists and other famous individuals and their fan bases has changed. Fans today, empowered by Social, see themselves as co-developers of the celebrity's brand and expect the celebrity to recognize that fact. They also see the celebrity relationship as an element of their personal brand. Celebrities are finding new ways to leverage their relationships with brands into new forms of direct commerce and endorsement. In some cases, the online presences of celebrities have become a new form of online retail. Social graph development and exploitation may represent the leading edge for retail's future. Winning in Social requires us to first win with our Customers. This is a true crossroads for companies and their Customer Service departments. Will companies pivot beyond trying to shut their Customer up on the Social web? How will it change the experience for the Customer? And on the inside, how will it affect your Customer Service staff? The future will look very different for service organizations. Join Frank and Brian as they discuss this shift in the marketplace and what's possible in this new hyper-connected world. What Social data should I measure? What can I learn? How should I act on it? Join Susan Etlinger as she answers these questions and discusses what it takes to move from basic metrics and “analysis paralysis” to real insights and action. During the webinar, Susan will discuss the state of Social measurement within the enterprise and explore what we can learn, how organizations must adapt and what new skills, pitfalls and opportunities exist for brands within the “big data” world. Trust is at the center of all business relationships and social media provides a unique opportunity to build trust with customers, partners, and employees in new ways. This webinar will examine how companies are building trust through greater transparency and authenticity -- and how they are seeing their businesses transformed. We'll also discuss actions you and your organization should take today to build greater trust. Pivot is an exclusive two-day event, October 15-16, 2012, for top brand managers who seek to bridge the gap between their brand and the rising Social Consumer. Directed and hosted by Brian Solis—principal at Altimeter Group and a globally recognized thought leader in social media who has led interactive and social programs for Fortune 500 companies, notable celebrities, and influential startups—Pivot 2011 will deliver the context and understanding you need to redirect marketing dollars, create authentic interactions, and map a strategy of successful engagement with this powerful new market.